The UMI is a tabletop, universal fiber optic datalogger ideally suited to performing multi-point temperature, pressure, strain and displacement measurements. The UMI is a tabletop, universal fiber optic datalogger ideally suited to performing multi-point temperature, pressure, strain and displacement measurements in applications that are hostile to non-fiber optic transducers. Roctest’s fiber optic temperature, pressure, strain and displacement transducers feature complete immunity to microwave and RF radiation with high temperature operating capability, intrinsic safety, and non-invasive use. 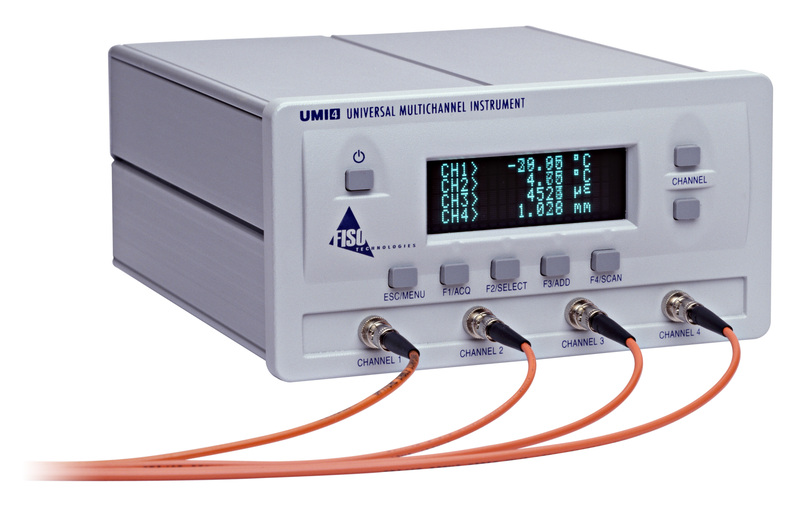 The UMI is designed to perform accurate multi-channel measurements. The system can scan through all the channels in use with a switching time of 0.15s, or sample one specific channel at a rate of 20 Hz. A 7-digit gauge factor affixed on the connector of each transducer allows the UMI conditioner to easily recognize the transducer type and calibration. Through the use of a white-light cross-correlator (U.S. Patents 5,392,117 and 5,202,939), the UMI datalogger is capable of measuring with astonishing accuracy the absolute cavity length of Fabry-Perot fiber optic transducers, providing highly accurate and reliable measurements. The UMI has a 0.01% F.S. resolution (without averaging) and 0.025% F.S. precision. The UMI datalogger has a non-volatile memory buffer that can store up to 50 000 data samples. Datalogging sequences, duration and other operational parameters are easily programmable using the front panel interface or through the RS-232 communication port. Each channel has a dedicated ±5 V adjustable analog output. The use of a flash EEPROM allows for easy firmware upgrade.